Last week I announced that I was going to run a small knit-along - the #winterwoolkal - aimed at carrying on, in some small way, the fabulous Wovember love from previous years. You can read the original blog post here. I had planned to do a slightly bigger event but my enforced wi-fi break the week before during our family holiday meant that it was all a bit rushed. Still, I was very pleased with the enthusiastic response. Lots of knitters gleefully rootled through their stash or took the opportunity to buy a skein from a new-to-them producer or dyer. So far so good. It was a bit of a surprise then to be greeted with, what a friend laughingly termed a ‘wool backlash’. I received a steady stream of emails, PMs and messages suggesting that my focus on 100% wool (the original Wovember principles) was somehow elitist and risked alienating a large number of knitters. Quite apart from the hysterical thought of a bunch of grown adults being scared off by 50g of Blue Faced Leicester DK, my grandma (who always knit with with wool) would have been tickled pink to be called elitist. Seriously! How can the choice of wool over other fibres be controversial. It has been such a staple of textile production for 100s of years. I think many of the comments stem from the misconception that wool is somehow expensive and that certainly seemed to be a recurring theme in my emails. This is an excellent article by Louise of KnitBritish which most excellently debunks that myth. I have always maintained that there is a valid place for acrylic yarn. But that place is not in a KAL aimed at promoting wool and the British wool industry. Including acrylic and other fibres in the KAL would detract from the whole message in the same way that calling a £1 ball of acrylic yarn from Aldi “wool”, detracts from the value of wool as a living, breathing, essential resource for knitters. In addition, just because a group of people have chosen to apply the term “wool” to anything you can knit with (as opposed to calling it yarn) it doesn’t mean you can use it in a wool KAL. If it didn’t come from a sheep then it isn’t wool. Nothing beats the the feel, the squish and the smell of real wool. No one - to my knowledge - has ever ripped open a bag of petroleum based yarn product and gleefully inhaled the aroma within. And for that reason, I am and will remain a wool enthusiast to my very core. Summer Knit School is open. The school holidays are looming large on the horizon and I'm trying to make plans - both knitting and otherwise for the summer. Somewhere between the change in routines, the warm weather and the holidays I often find that I go through something of a creative slump. In previous years I used to really worry about this but now I've accepted that some seasons are just a bit more productive than others and there's absolutely nothing wrong with that. What I am planning though is a bit of a creative summer challenge - both for myself and also for you if you'd like to join me. You can click the link to sign up to receive a weekly prompt from me and I'll be running it mainly over on Instagram with the hashtag #summerknitschool. Nothing too taxing, nothing stressful - just some thoughts and ideas you might want to try to give your creativity a gentle nudge. It's all totally free and hopefully stress-free too. And this way, who knows, by the time the cooler weather and sweater season is upon us you might be raring to go and fizzing with new ideas. Oh - you might want to buy a new notebook too! Sign ups are open now and the first challenge starts on Monday 23rd Jul. 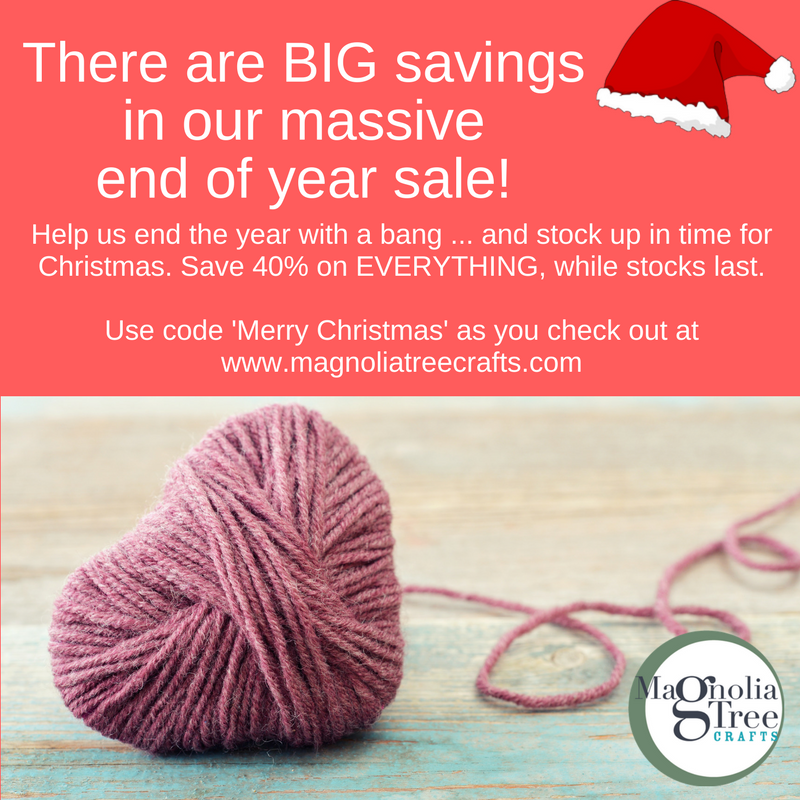 I'm excited to be able to share with you some exciting news today - that I have joined up with the fabulous Lucy of Magnolia Tree Yarns in an affiliate program. If you don't know of Lucy already she has a wonderful site full of woolly goodness, that's packed full of some amazing yarns. She also has a really comprehensive range of resources on the site and runs in person workshops too. Based in Cheshire, Lucy aims to offer a well stocked, friendly and knowledgeable LYS and she also backs that up with a comprehensive website too - so she can be your LYS no matter where you are. To kick start our affiliate relationship Lucy is offering a flash sale, starting today with 40% off everything in her online store - while stocks last. And as I'm about to start my 12 Days of Christmas Event it seemed like the perfect opportunity to share this with you. Just head over to her store by clicking here and have a browse - you might find the perfect yarn to go with one of my 12 Days' pattern offerings. Full disclosure here: if you click on the link above and make a purchase a small percentage comes to me as an affiliate. I'm sure it won't have escaped your attention that Christmas is hurtling towards us at the speed of light and knitters everywhere are frantically burning the midnight oil to finish those holiday gifts. This time of year can feel stressful and hectic, often I just want to bury under a pile of blankets (handknit of course) and emerge in the New Year. Last year I was inspired to try a Random Acts of Kindness challenge - doing something for someone else every day in December. This year I thought I would step things up a little by running a series of 50% pattern discounts - one per day - for the first 12 days of December. The final line up is still in draft form but I will probably try to alternate a shawl pattern with a sock pattern. I know that many of you lovely, loyal folk might already have some of the patterns that I offer, so in that case you could always consider having your own random act of kindness event and gifting a discounted copy to a friend. The ever helpful Ravelry makes gifting a pattern really easy and it's always lovely to get a gift message in your Ravelry inbox. Each day for the first 12 days in December I'll send out a short email notification with the pattern and the discount code and each promotion will run for 24 hrs (please note that I am on GMT, London time). If you don't currently subscribe to my email list - this might tempt you to sign up. Please feel free to share the code with others and on your own social media - and I'll also announce it via the other usual channels - Instagram, my Facebook page and Twitter. Although I might need a fortifying glass of mulled wine to get all that scheduled. So, tell a friend, set your reminders and get ready to celebrate a bit of seasonal giving with me. And yes, mulled wine is absolutely encouraged.